This historic location is where the early mound builders were first studied and where their culture became known as the Hopewells. The site is located a few miles west of Chillicothe are the remains of a massive Hopewell earthwork. While today, the earthworks are mostly gone, what does remain only reinforces the concept of how large these earthworks actually were and that they were all constructed by manual labor. This site is on a truly massive scale and includes what at one time was over 3 miles of an earthen wall that averaged 4' - 6' in height, enclosed more than 127 acres where the mounds were located. Inside this enclosure were at least 40 mounds including on large mound near the center of the complex that was more than 30' in height. The site was named after the Hopewell family who owned the site in the 1890s when the site was excavated. Since this was the first scientific excavation of the earthworks, it was determined the builders were different from some of the other mounds found in the area such as the Adena Mound. 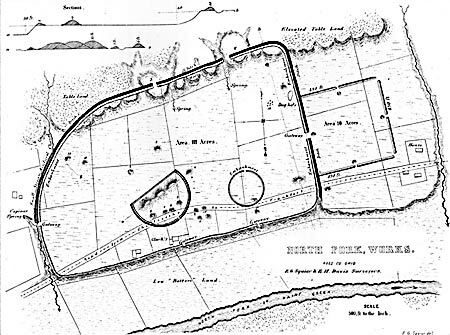 Thus, the culture that created these earthworks became known as the Hopewell Culture. When the site was excavated, the largest and most striking total set of Hopewellian cultural remains of any site in Ohio were unearthed. These artifacts were first displayed at the World's Columbian Exposition of 1893. They were then given to the Field Museum in Chicago where they remain today. A later excavation between 1922 and 1925 revealed additional artifacts which are now on display at the Ohio Historical Society in Columbus. Today the area has become part of the National Park Service. A hiking trail has been built around the northern rim of the earthworks. At this time, there is scant information on display at the park, nor are any of the mounds visible to the untrained eye. Most of the mounds have been eroded by extensive farming. The distinctive effigy hand (shown at left) was recovered from Mound #25 at the Hopewell Mound Group. Obsidian has been found at a few Hopewell earthwork sites. The majority of obsidian, several hundred pounds, was found in one mound at Hopewell Mound Group. It has been determined that some of the obsidian came from Yellowstone National Park in Wyoming- over 1,500 miles away. 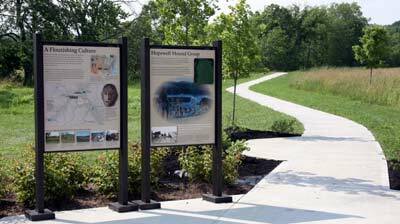 Hopewell Mound Group is located along Sulphur Lick Road near the intersection of Maple Grove Road.